The Republic in New Orleans was the Howling Wolf pre-Katrina. It is an old warehouse that once stored coffee after being loaded off of the ships from the port. It still smells like coffee. It has a layout similar to the House of Blues. It is located in the Warehouse district which is a few blocks from the French Quarter. The main floor is standing room only and because of the low balcony you need to get from under the balcony area to experience the full effect of the entertainment. This is a popular place so I would recommend getting there early if you are planning to see a show. The last event I saw at the Republic in New Orleans was Ghostland Observatory. These guys are great. They are made up of only a lead singer and his mixer but they can really put on a show. Known for their laser display show which enhances their style of music. The style is a cross between techno and 80′s Halloween music. They really have a unique sound that some new acts are starting to emulate today. The only part that I didn’t like about the show was how long it took for them to come on stage. The opener was DJ Jubilee who has been a NOLA Local favorite for the past thirty years. I didn’t mind that he went longer than planned but there was a good two hour wait between him and Ghostland Observatory. We almost walked out because we had plans to meet friends afterwards but once they started to play it was like wow. It was like the Republic in New Orleans was made for them. They have so much energy and are so intriguing that you didn’t want them to stop. I recommend that you check them out if they are in your area. I also recommend that you check out the Republic in New Orleans because it is a really happening place and is always a unique experience. You will also like the area. There are a lot of fun bars and clubs near by along with some amazing restaurants. If you want to learn more check out the Hotel Monteleone’s review of the Republic in New Orleans. 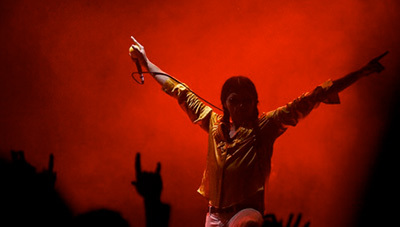 If you want to catch a glimpse of Ghostland Observatory’s brilliance you must see this video.